Dermatologists at the University of Edinburgh put 24 volunteers — all in their early 20s — under tanning lamps. In one 20-minute session, they were exposed to UV and heat lamps; in another, the UV rays were blocked. After each session, the team measured the subjects' blood pressure. SEE MORE: Have the White House scandals already passed their peak? The researchers say sunlight lowers your blood pressure, which brings down your risk of heart disease. After the heat-lamp only sessions, there was no change. Following the sessions with the UV lamps, however, the volunteers experienced significant decreases — 2 mmHg — in blood pressure that lasted about an hour. Prolonged dips that big, the authors of the study say, translate to seven- and 10-percent reductions in the risk of heart disease and stroke, respectively. Would that really offset the risk of skin cancer? Possibly. Heart disease and stroke linked to high blood pressure are blamed for 80 times more deaths in the U.K. than skin cancer. The researchers say they'll need to do more research to confirm their early conclusions. "We now plan to look at the relative risks of heart disease and skin cancer in people who have received different amounts of sun exposure," says Dr Richard Weller, leader of the research team. "If this confirms that sunlight reduces the death rate from all causes, we will need to reconsider our advice on sun exposure." SEE MORE: What would YOU do? How is the report being received? Quite cautiously. 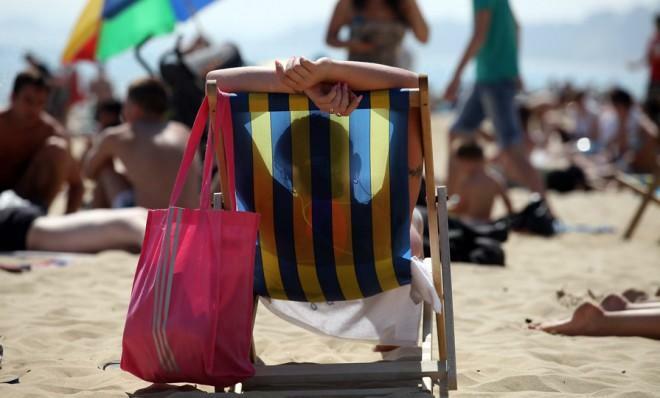 "The alarmist scare tactics may have been overstated," says Stephen Naysmith at Scotland's The Herald, but this doesn't change the basic and potentially deadly fact that over-exposure to the sun can cause skin cancer. You still need to cover up when possible. Slather on sunscreen — especially on kids — and be on the lookout for suspicious moles. And there are "still many safer ways of reducing blood pressure" than baking in the sun, says Lindsay Abrams at The Atlantic. Is anyone cheering the research? Yes. Some say it's healthy to weigh both the pros and cons of sun exposure, and acknowledge the good side of soaking up a few minutes' of rays every day. "Sunlight is a crucial source of vitamin D," notes Alison T. Brill at Commonwealth Conversations, which strengthens bones and the immune system, and can lift your mood by increasing levels of serotonin, the brain's natural mood-lifting chemical. "The sun is a superstar in many ways," says Brill. Why will half of all Americans be diagnosed with a mental disorder in their lifetimes?